WHAT IS IT? Without a doubt, ARC is one of the most creative lever companies in the history of the sport—proven by the fact that ARC levers are found on the handlebars of most of the AMA Supercross stars’ bikes—most notably Eli Tomac’s. ARC pioneered and perfected folding levers, unbreakable Memlon levers and adjustable ratio levers. 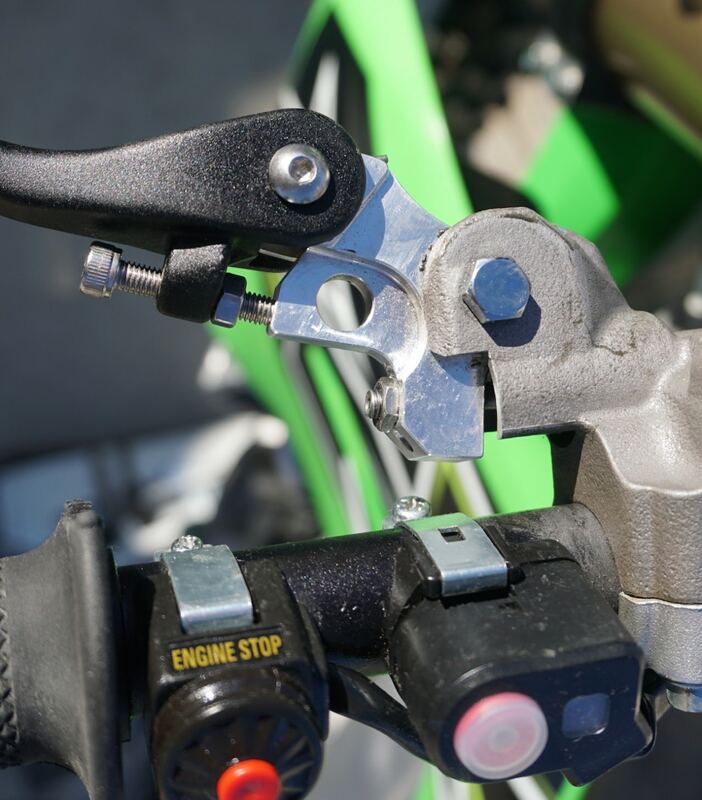 When we had trouble with our stock 2019 Kawasaki clutch lever, we called ARC’s Bob Barnett. If he’s good enough for Eli, he’s good enough for us. WHAT’S IT COST? $129.99 (PowerLever clutch). WHAT STANDS OUT? Here’s a list of things that stand out with ARC’s 6-way adjustable PowerLever. (1) The problem. 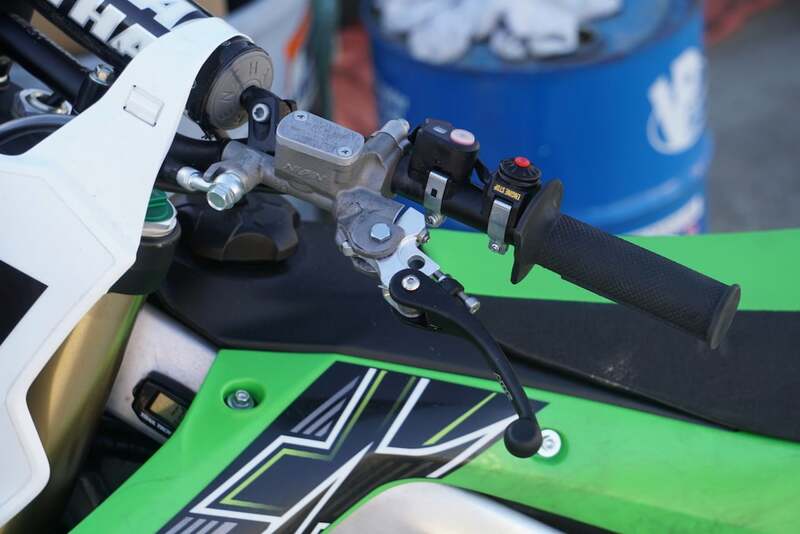 When we met ARC’s Bob Barnett at the track, we told him we had two issues with the stock 2019 KX450 clutch lever. The first issue was that the clutch lever hit our fingers when we pulled the clutch in and, because of the lack of space on the 7/8-inch crossbar-equipped KX450 handlebars, we couldn’t move the perch far enough over to give the lever more room. Bob said that he had a lever that could fix that. The second issue was that we were burning up KX450 clutches for no good reason. Bob said that he knew what the problem was and had a lever that could fix it. He immediately began installing a CNC-machined lever with lots of secret widgets hidden inside. (2) Design. 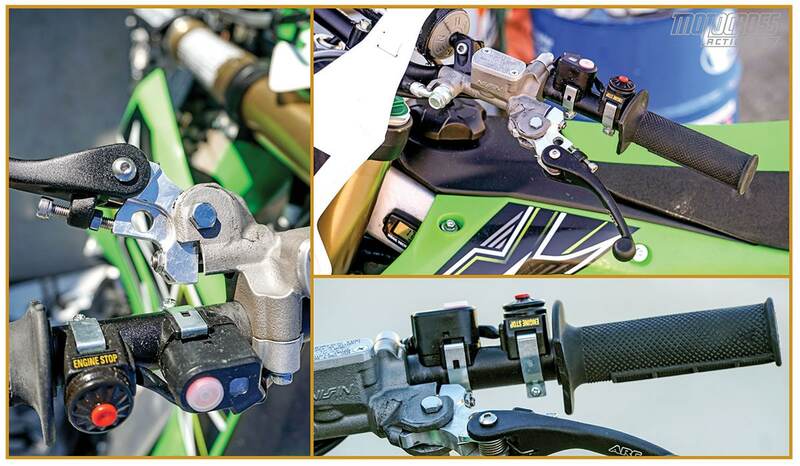 Bob installed his 6-way adjustable PowerLever on our KX450. This isn’t just any lever. It comes with three “FlipChip” inserts that give you six different power ratios for your clutch. The FlipChip is a small block of aluminum with divots machined on each side of it. Each divot is machined into a different location on the aluminum block. The six divots offer different ratios that change the distance from the lever pivot center to the centerline of the push-rod that actuates the clutch master cylinder plunger. By changing from the softest divot to the hardest divot, you can change how far the master cylinder plunger is pushed. In the case of our KX450 clutch mechanism, we needed the FlipChip divot that pushed the plunger sooner and farther for the same throw of the lever. This disengaged the clutch sooner and thus farther away from our fingers. (3) Solution. It turns out that when the stock clutch lever hits your fingers, the clutch is not fully disengaged, which means that you are slipping the clutch every time you pull it in. With ARC’s PowerLever, the clutch is fully disengaged. It works likes this: when you use the 14mm chip, you get the “softest” feel. If you flip it to the 19mm divot, you get the “hardest” feel. You can switch to any of the six divots to find the best feel for you. Additionally, ARC clutch levers compensate for Rekluse-style clutches, and hydraulic clutches benefit greatly from the ability to overdrive the master cylinder, and to get that “pinch” more pull when needed. (4) Performance. It solved our problem with the KX450 clutch. Plus, we liked the shape and bend of the ARC levers much better than the KX450 levers, especially because the 2019 KX450 comes with totally different shaped levers on the clutch and brake. We added an ARC brake lever along with the clutch lever to make the two levers feel the same. If an ARC lever breaks, the company will replace it for a nominal $15 fee. WHAT’S THE SQUAWK? The price. This is a very expensive lever. MXA RATING: We suffered a recurring problem with the 2019 clutch lever and ARC fixed it. Kudos.